I would be lying if I said that I'd turned up at the media ride based in Uttarakhand, a few kilometres above Rishikesh, with a complete lack of apprehension about the Mahindra Centuro. But when we started the bikes in the morning under an overcast sky, the first sign of things to come was a quiet, confident idle. What you notice is the large central tachometer, almost a novelty in the segment and a most welcome one. On both sides is the full complement of idiot lights and below that is an LCD panel in three parts. The left part hosts the DTE and the fuel gauge. 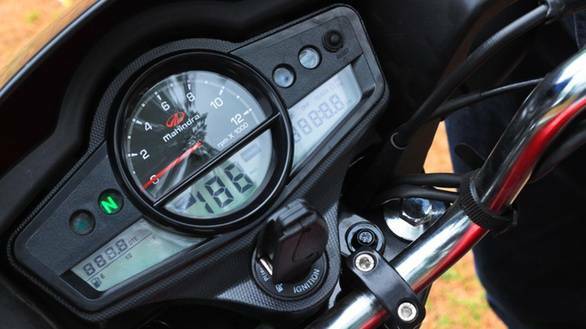 The middle has a big-font digital speedometer with one indicator each for service due and for economy mode (a simple prompt that appears between 40 and 60kmph that prompts the rider to stay within that speed range). The right toggles between a trip meter, odometer and a clock. 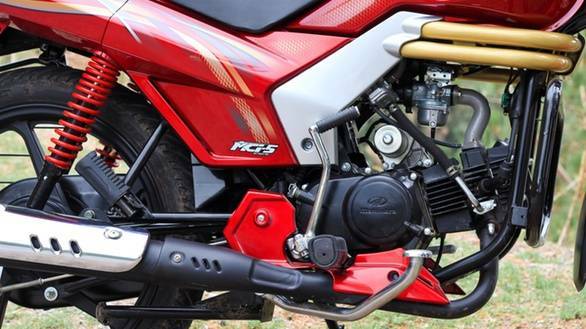 It is an unusually comprehensive feature set for an entry-level motorcycle where most bikes offer little more than a speedo, fuel gauge and the idiot lights. And then you notice the key. It looks like an unusually large black piece of plastic where a key should go. Pull it out and you get a switchblade style key. The sort that an Audi might get, though the plastic is distinctly more economy class. 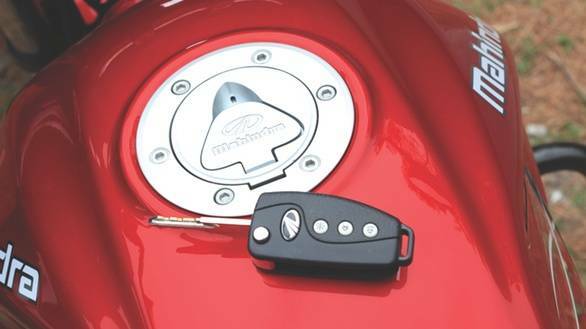 Mahindra claim the battery will last for two years and also take the time point out that many car makers offer one fob per car  the other is a simple key. But the Centuro gets two key fobs as standard. A process that verifies your identity before a replacement key fob is issued is being put in place as well. The Centuro feels very smooth at low revs, torque delivery is seamless and it goes like you expect a 100cc segment bike to. The Pantero used to get loud and harsh above 6-6500rom, but the Centuro stays quiet and composed until about 8,000rpm before any signs of harshness manifest. We spent an extended period cornering on the mountain roads staying above 5,000rpm. And even at these sustained revs, the engine stays composed, performance is definitely within the segment's expected levels and there are no signs of mechanical distress or fatigue. The gearbox similarly is slick enough and keeps up though I have my usual reservations about the all-up shift pattern. Mine was a short ride but I think it will be interesting to test the Centuro back on flat ground against the competition. I think a couple of competitive entry bikes are about to be surprised. On the ride and handling front too, the Centuro is a different beast. Shod with grippy MRF Nylogrip Zappers, the chassis is composed. I found the balance between ride quality (who thought putting a speed breaker in the middle of a corner was a great idea, then?) and handling particularly pleasing. The said speed breaker was handled without fuss and even extended ragged stretches of mountain road were handled deftly. I was on the gas, up on the pegs, allowing the wheels, suspension and chassis to take the punishment and it more than did its job. Even cornering the Centuro is equally eye-opening. It flicks into corners happily, is stable mid-corner and you only realise you are, in fact, riding a tiny 110cc machine when you open the gas and try to make a spiffy exit. Well, riding the bike in an unfamiliar environment, even a challenging one like this, can only serve as an introduction, a sort of sign of things to come. The real test is when we have the bike facing our tests in an environment where we normally test all bikes, which allows for far greater comparability. And besides, the price isn't out yet. What I know for sure is this. 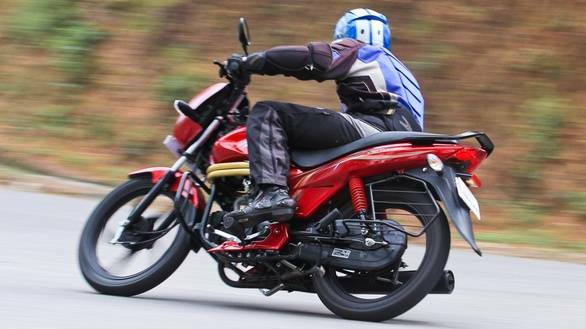 Mahindra has pulled off a bit of a coup in just how good the Centuro feels on the road. 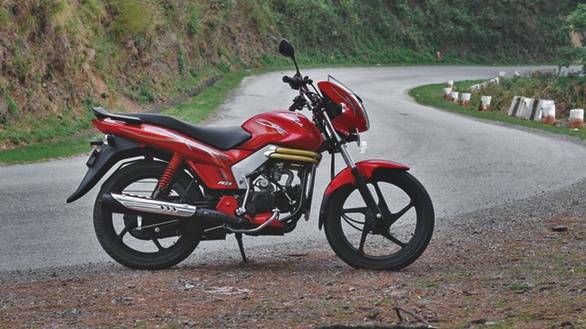 The motorcycle is a great sign of things to come from the Mahindra two-wheeler stable. It probably won't win the inevitable entry-level motorcycle comparison test but I can tell you this, it will not be at the end of the standings. When is the price coming? Mahindra is set to announce a competitive price on July 1. We expect the price to be in the usual ? 40-45,000 bracket. Mahindra currently will not offer a disc brake version though they are very close to completing the prototype so that they will then have the ability to offer the disc if there is demand.